The mission of the Companion Animal Parasite Council (CAPC) is to foster animal and human health, while preserving the human–animal bond, through recommendations for the diagnosis, treatment, prevention, and control of parasitic infections. For more information, including detailed parasite control recommendations, please visit capcvet.org. Ticks, which many taxonomists think of as giant metastigmatid mites. Different varieties of S scabiei infest a wide range of mammalian hosts. Clinical Findings. These mites tunnel into the host epidermis, causing scabies, an intense, pruritic dermatitis with hyperkeratosis and alopecia. Some dogs develop a severe form of sarcoptic mange, crusted scabies, with large mite populations within profound hyperkeratosis. Transmission. Infestations are transmitted through direct contact between animals or fomites (eg, clipper blades). S scabiei does not have an environmental stage, but there are reports of their survival for several days off of the host. Diagnosis. Diagnosis of scabies involves visualization of Sarcoptes mites in skin scrapings, which need to be deep enough to examine the full thickness of the epidermis (ie, to produce blood-tinged samples). S scabiei can be present despite repeated negative skin scrapings. Anecdotally, the ear itch reflex can be more helpful in presumptive diagnosis than skin scrapings. Empirical treatment and monitoring for response to treatment may be justified if mites are not seen but lesions strongly suggest sarcoptic mange. Treatment. Several flea- and tick-control products are also labeled for preventing, treating, or aiding in treatment/control of canine sarcoptic mange; the active ingredients are listed in Table 1. Clinical Findings & Diagnosis. Infection with O cynotis—which infest the external ear canal and surrounding skin of dogs, cats, and ferrets—results in head shaking, ear scratching, and inflammation of ear canals. These mites can be observed with an otoscope or by ear canal swabs. Treatment. Selamectin is labeled for treatment of canine and feline O cynotis infestations. Secondary bacterial or fungal infections can be present, and these conditions should also be treated when suspected. The cigar-shaped Demodex species is a common parasite of mammals, and mites are usually present in low numbers within hair follicles or sebaceous glands. Clinical Findings. Demodectic mange in dogs, often attributable to an overgrowth of Demodex mites, is a moderate to severe disease often associated with underlying systemic disease or a suppressed immune system, as described in more detail elsewhere.4,5 Demodectic mange can be exacerbated by secondary bacterial infections, resulting in a severe form of the disease known as red mange. Diagnosis. Although easily identified to the genus level, diagnosis of demodicosis requires careful microscopic examination of deep, bloodtinged skin scrapes from alopecic areas to observe the pale cigar-shaped mites. This group includes mites that can become pests when brought into buildings by birds or rodents. These non-burrowing mites feed on the keratin layer of epidermis in canine nasal and paranasal sinuses. Clinical Findings & Diagnosis. Although heavy infestations can cause sneezing and epistaxis in some dogs, they are often diagnosed by chance. The relatively large adult mites (> 1 mm, with legs extending beyond edges of their bodies) are visible to the naked eye, and may be seen in nasal secretions or crawling in the nasal cavity during rhinoscopy. Only about 10 of the approximately 850 known tick species have varying degrees of medical importance in the U.S. These include members of the tick families Argasidae (soft ticks) and Ixodidae (hard ticks), the latter of which are further divided into 2 subfamilies, with distinct biologic features that affect feeding behavior and vector competence. Table 2 briefly describes some of the tick-borne diseases and zoonoses that affect dogs in the U.S.
Tick-Borne Diseases of Dogs & Cats in the U.S.
DISEASE PATHOGEN PATHOGEN TYPE KNOWN/PUTATIVE VECTOR(S) ZOONOTIC DISEASE? 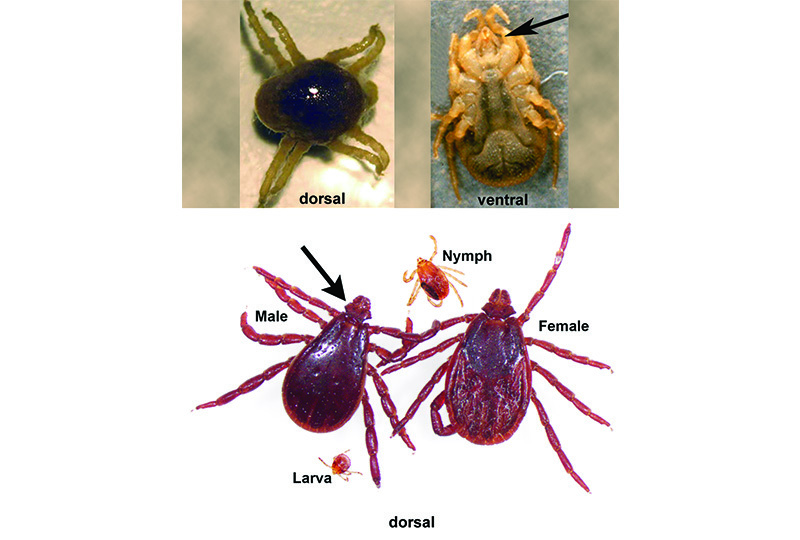 Soft-bodied ticks lack a sclerotinized dorsal scutum and are further characterized by mouthparts that originate on the ventral surface, though these mouthparts may extend beyond the anterior to become visible from the dorsal surface (Figure 2). Larval and nymphal stages of the one-host spinose ear tick—Otobius megnini—infest mammalian ear canals, including those of dogs and people. These ticks are not known to be a vector for pathogens but can cause a painful form of otoacariasis. Members of another argasid genus, Ornithodoros, live in dwellings or bedding areas of their hosts, taking multiple short blood meals over the course of several months to several years. Ornithodoros species have not been demonstrated to parasitize dogs in the U.S.; however, they are known to feed on dogs in other countries,10 and relapsing fever spirochetes vectored by Ornithodoros have been found in dogs from Florida,11 Texas,12 and Washington,13 suggesting that further investigation is warranted. Table 3 describes the distribution, common hosts, and known pathogens transmitted by ixodid ticks most commonly reported to feed on dogs in the U.S. Examples of Medically Important Ixodid Ticks in the U.S.
All but the genus Ixodes can be eliminated as potential vectors of B burgdorferi, A phagocytophilum, and probably the E muris–like agent. Similarly, ticks outside the genus Amblyomma are unlikely vectors of E ewingii or H americanum. Ticks outside the genus Rhipicephalus do not transmit B vogeli. Ticks outside the genera Rhipicephalus and Dermacentor are not known to transmit E canis. Morphologic Characteristics of Major Ixodid Genera in the U.S.
As previously indicated, controlling diseases caused by tick-borne pathogens is the most important reason for tick control. Historically, the most successful approaches to vector-borne disease control have used procedures that limited vector access to susceptible hosts. Given the diversity of pathogens that ticks transmit to dogs, this is particularly true for canine tick-borne disease. Canine Lyme borreliosis, for example, may be prevented with the aid of several commercially available vaccines, and the decision to use such vaccines is warranted in areas where Lyme disease is endemic. However, certain etiologic agents of anaplasmosis and ehrlichiosis are adapted to the same Ixodes species that transmit Borrelia burgdorferi; therefore, tick control is still necessary to protect susceptible hosts from these additional pathogens. Effective tick control is approached from different perspectives, which include measures to reduce tick populations in the host environment as well as on individual hosts. Fences can exclude wildlife and stray pets that may introduce parasites into a dog’s habitat. Controlling potential food sources, such as garbage, pet food, or vegetation, limits attraction of tick amplification hosts, such as raccoons, opossums, or deer, to the peridomestic environment. Laying mulch in transition areas between wooded areas and lawns limits tick migration into the lawn and provides a zone for concentrated application of residual pesticides to control ticks. As with most parasites, desiccation of free-living stages is a valuable control measure; desiccation of unattached ticks is promoted by cutting grass and by removing debris, such as leaf litter, that could provide microhabitats that, in turn, promote off-host survival of ticks. Dogs. Individual hosts can be further protected by preventing them from roaming into areas frequented by animals unprotected from tick infestation, and ticks found on pets should be removed immediately to limit the likelihood of pathogen transmission. The array of effective tick preventives on the market is expanding. These products (Table 5) contain one broad range molecule, or a combination of molecules, that kill and/or repel ticks.17 Although choosing from the many effective tick preventives can be challenging, the option of switching to a product based on a different molecule or drug class helps ensure that an efficacious solution is always found. Note that several of these products can be toxic, and subsequently lethal, to cats, so it is critical to carefully check labels to ensure that the right product is applied to the appropriate host species. CAPC recommends year-round application of these safe, affordable products to protect pets against unexpected exposure to ticks, even outside of tick season. Additional, in-depth, and regularly updated information regarding parasitic disease control guidelines is available at capcvet.org. Learn More Read Canine Arthropods: Class Insecta—Recommendations from the Companion Animal Parasite Council in the November/December 2014 issue of Today’s Veterinary Practice, available at tvpjournal.com. Arther RG. Mites and lice: Biology and control. Vet Clin North Am Small Anim Pract 2009; 39(6):1159-1171, vii. Dryden MW. Flea and tick control in the 21st century: Challenges and opportunities. Vet Dermatol 2009; 20(5-6):435-440. Blagburn BL, Dryden MW. Biology, treatment, and control of flea and tick infestations. Vet Clin North Am Small Anim Pract 2009; 39(6):1173-1200, viii. Gortel K. Update on canine demodicosis. Vet Clin North Am Small Anim Pract 2006; 36(1):229-241, ix. Singh SK, Dimri U. The immuno-pathological conversions of canine demodicosis. Vet Parasitol 2014; 203(1-2):1-5. Mueller RS, Bensignor E, Ferrer L, et al. Treatment of demodicosis in dogs: 2011 clinical practice guidelines. Vet Dermatol 2012; 23(2): 86-96. Ghubash R. Parasitic miticidal therapy. Clin Techniq Small Anim Pract 2006; 21(3):135-144. Kuehn NF. Canine nasal mites. In Aiello SE (ed): The Merck Veterinary Manual. Whitehouse Station, NJ: Merck Sharp & Dohme Corp, 2012, p v.
Esch KJ, Petersen CA. Transmission and epidemiology of zoonotic protozoal diseases of companion animals. Clin Microbiol Rev 2013; 26(1):58-85. Reck J, Marks FS, Guimaraes JA, et al. Epidemiology of Ornithodoros brasiliensis (mouro tick) in the southern Brazilian highlands and the description of human and animal retrospective cases of tick parasitism. Ticks Tick Borne Dis 2013; 4(1-2):101-109. Schwan TG, Raffel SJ, Schrumpf ME, et al. Phylogenetic analysis of the spirochetes Borrelia parkeri and Borrelia turicatae and the potential for tick-borne relapsing fever in Florida. J Clin Microbiol 2005; 43(8):3851-3859. Whitney MS, Schwan TG, Sultemeier KB, et al. Spirochetemia caused by Borrelia turicatae infection in 3 dogs in Texas. Vet Clin Pathol 2007; 36(2):212-216. Kelly AL, Raffel SJ, Fischer RJ, et al. First isolation of the relapsing fever spirochete, Borrelia hermsii, from a domestic dog. Ticks Tick Borne Dis 2014; 5(2):95-99. Nicholson WL, Allen KE, McQuiston JH, et al. The increasing recognition of rickettsial pathogens in dogs and people. Trends Parasitol 2010; 26(4):205-212. Little SE, Heise SR, Blagburn BL, et al. Lyme borreliosis in dogs and humans in the USA. Trends Parasitol 2010; 26(4):213-218. Stich RW, Schaefer JJ, Bremer WG, et al. Host surveys, ixodid tick biology and transmission scenarios as related to the tick-borne pathogen, Ehrlichia canis. Vet Parasitol 2008; 158(4):256-273. Companion Animal Parasite Council. Product applications for dogs. Available at capcvet.org/resource-library/parasite-product-applications- for-dogs. I. Craig Prior, BVSc, CVJ, is the owner and medical director of Murphy Road Animal Hospital, in Nashville, Tennessee, and a member of the CAPC Board of Directors. He shares his knowledge through speaking engagements throughout the country and guest appearances with various media outlets. Dr. Prior received his veterinary degree from University of Queensland (Australia).